Session 5: Off site at your organisation: A one on one consultation to review the outcomes of the Governance Audit. This is an opportunity to arrange a consultation with the workshop organisers for feedback and discussion about board development with your Board Chair and as many of the Board as you choose. To be arranged at a time convenient to your board, with two months of the workshop date. Program leader Mark Schultz is a highly experienced and qualified practitioner, business advisor and author in corporate governance, with considerable expertise in the not for profit sector. His practical and straight forward approach to governance has been developed and refined over a career spanning in excess of 30 years. Program leader Gayle Boschert is an experienced board member, working as a Chair and an active board member for more than 15 years for a range of different community businesses in the health and welfare sectors. She has wide expertise in the challenges of corporate governance, particularly the shift from an operational to strategic focus which is so essential for the successful operations for community boards. 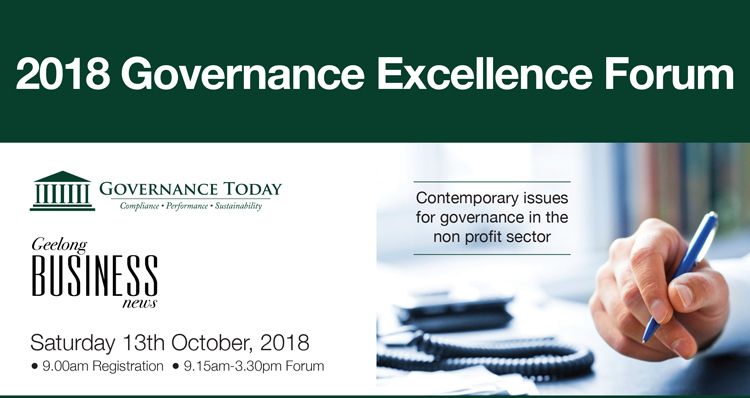 Participants will be provided with a copy of “Good Governance Good Business,” workshop notes and resources including a governance audit & board evaluation framework as well as member access to the Governance Today website.